Blogger post editor has options to add Images and Videos but Presentation can be added too if you know just the basic concept of using Blogger Templates editor. 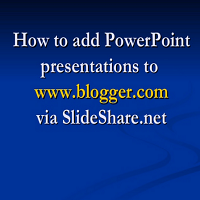 Ever wanted to add a PowerPoint/PPT Presentation to your Blogger post. Confused how can you embed a PowerPoint Presentation? Here are some simple steps to do the same. Follow these steps to add PPT Presentation to your Blogger blog. 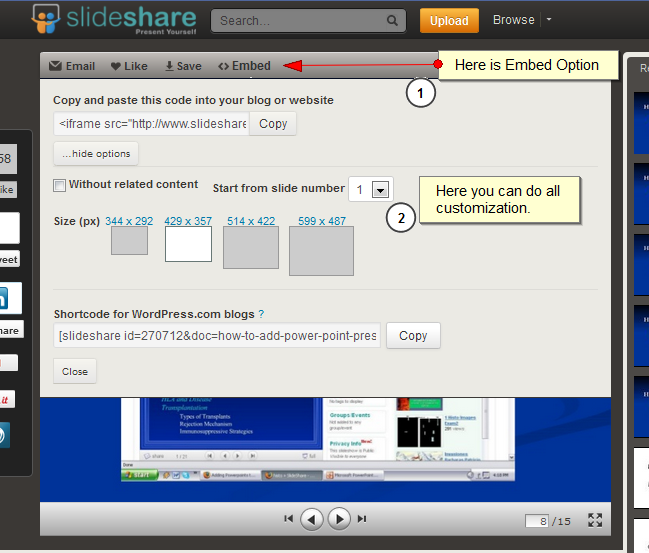 Go to Slideshare.net and login to your account. If you don't have have an account create a new one. Once you have logged in Click on Upload button from the top menu. After that click on Single upload from the sub-menu. Upload you presentation and add details like Title, Description etc. Now click on the option My Slideshow from the top menu bar and open your uploaded presentation. After the Presentation opens click on the embed option present on the menu just above the presentation. Click on customize if you want to change the size of presentation. After doing to the desired changes click on Copy. Now open Blogger post editor. Click on the HTML option which is beside Compose at Top Right. Paste the code copied from Slideshare. Publish your post and enjoy the Presentation. Thats it. Its not too tough. You just have to follow these 4 simple steps to add the presentation to your Blogger blog. If you face any problem do not hesitate to ask for help using the below Comment Form. This is great to add a ppt to a post. But is it possible to add a ppt on a sidebar? Because if you post a few other things, the post with the ppt is not visible.